I have painted a life where I was either depressed or full blow manic. However, this was not how it always was. I was able to stay on the honor roll. I was the first girl to be on the golf team. I started a group at my school for Amnesty International. I was the President of a Junior Achievement company and was the president of a 4-H group. I had friends who I would do things with including having them over, going to their house, going to movies, going roller skating, and to football games. I went to dances at my school. Our family had a pool so I would have friends over often. My dad would play his guitar around the campfire and all the people in the neighborhood would come and enjoy it. The other kids and I would play ghost in the graveyard or kick ball. My family and I went on a lot of great trips and I enjoyed them all except for one when I was slightly depressed. I loved playing in the band at school and also played the violin. I would have parties at my house. There were many times that I was happy and depression was not even present. However, I knew that it was lurking and never knew when it was going to appear again. This made it hard to plan things in advance. I also missed out on things. For example, I enjoyed golfing with the guys. However, after the season, I entered a depression phase and didn’t go to the party. I went away to camp and really enjoyed it. This was where I got my first kiss. I had great times with the girls in my cabin. I have so many great memories and pictures from that camping trip. I got the opportunity to go back a few weeks after that and sunk into a deep depression. I didn’t have fun at all. I did endure it and made it through the week. I had friends that I would sit with at lunch. Then, would miss school for a few weeks. When I came back, I didn’t feel welcomed anymore. They had moved on. 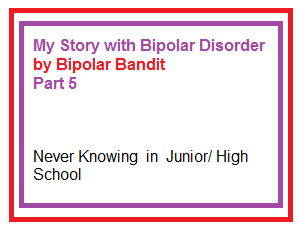 I was diagnosed bipolar at the end of first semester senior year of high school… I can relate to the nostalgia of the times before that point. I was highly successful in whatever I pursued, I enjoyed the good things in life w/o too much thought, and all of that was taken away from me. That aspect alone is traumatizing and haunted me for years. I noticed myself planning ahead as well, anticipating “bouts” of just not wanting to do things, and making hay while the sun shone and working ahead for weeks when I felt unusually… productive.